My arrival in Fairbanks co-incided with the rain. Folk of the city were delighted about this considering the 330 fires littering the state which had resulted in a dense smog over the city. I camped In a hostels garden and spent a much needed couple of days relaxing and talking to other guests. 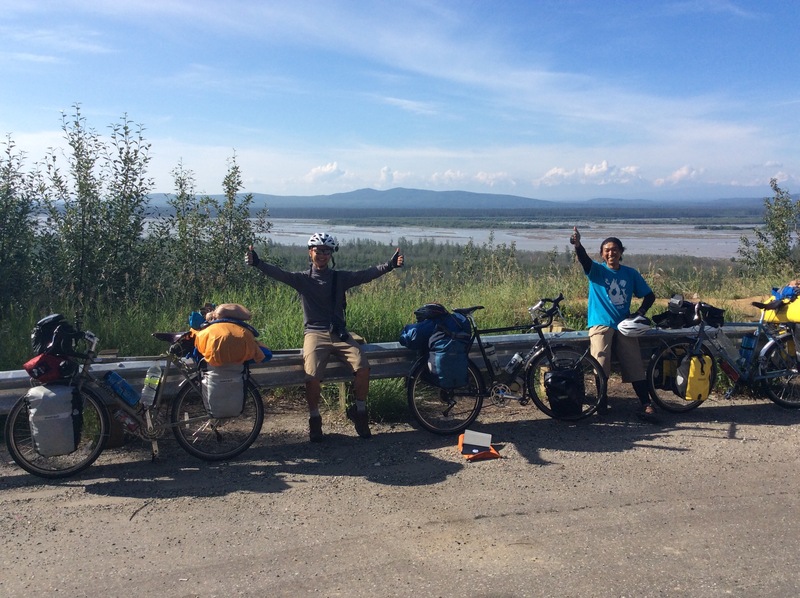 Managing to earn a decent slice of kudos after finishing the dalton was handy and I entered a weekend long eating contest with two likeable young brothers from Chicago who had spent the month floating down the Yukon river in a canoe. They were trying to pick up bikes and head up the dalton and I felt I should persuade them otherwise. I called in on Jeannie and Tony’s on my way out of town. 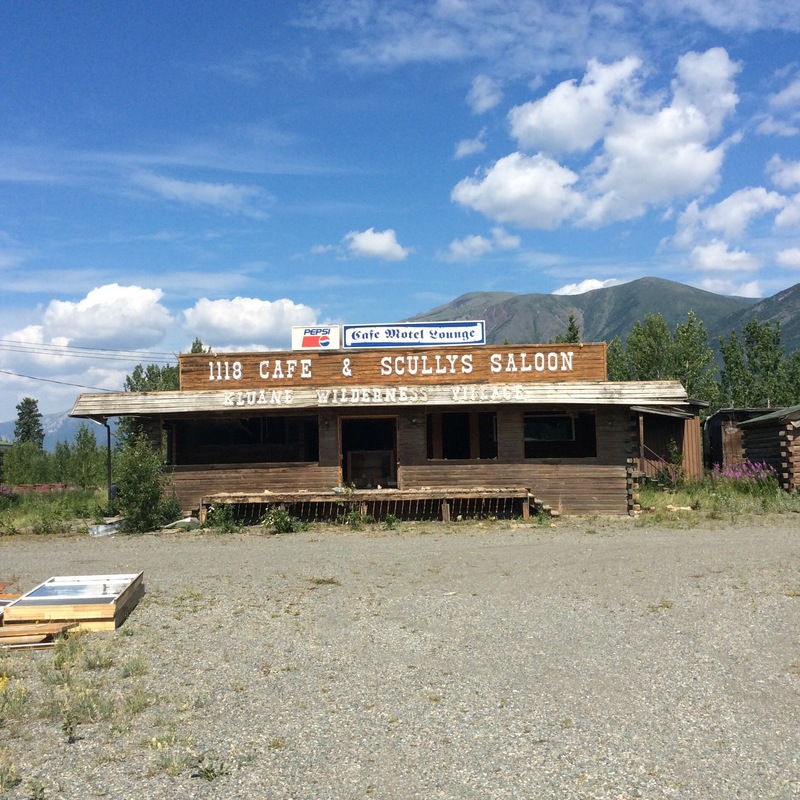 Tony gave me a good rundown on the road ahead and an update on the fires, I met the family and listened to some epic karaoke, stocked up on fruit and biscuits to head east along the Alaskan highway, bumping into some Japanese cyclists delighted to see we were all riding the same bikes. The next few days were easy cycling but very soggy. 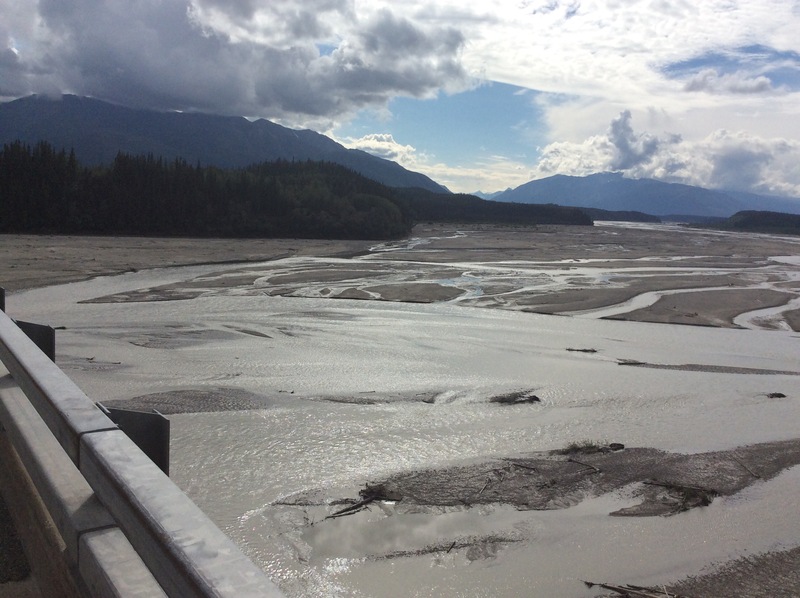 Alaska is apparently dry enough to be technically considered a desert but I had a week of rain. It wasn’t a problem on the bike but my kit just wouldn’t dry out. It sounds kind of stupid to say but sopping wet a hundred miles from the nearest building you start to appreciate the benefits of shelter. I bought a waterproof jacket, which wasn’t waterproof, waterproof trousers, which were more like a sponge, waterproof shoes which I was naive to believe would keep my feet dry and most disappointingly a tent designed for heavy rain but couldn’t handle a drizzle. A geologist named Lyndsey took pity on me and invited me to her work camp and plied me with beer and vegetable soup (vegetables being an Alaskan delicacy) and despite the rain I was getting into the lifestyle and terrain. Two weeks in it was time to leave Alaska as a fondness was developing, specifically down to an atmosphere of freedom. As Jim Nelson, who ran the post office in a community of ten houses called Dot Lake told me, “Alaska is the last place in the states your still allowed to make a fool of yourself”. I think he was referring to a sense of personal responsibility that comes with living in such isolation. It was interesting to hear of Jim’s 3 summer months which consisted of getting ready for the winter by chopping wood and hunting moose to freeze, his ears black and shrivelled due to harshness of the other 9 months. There was a noticeable community of people travelling around the state especially bikers (of the motorised kind), pitching up, cooking on fires and camping as and where they liked which was very much possible due to the extent of public land. I developed a bit of a rapport with the bikers who seemed to appreciate my 2 wheeled efforts with lots of fist pumping and shared sandwiches. Getting into Canada proved a struggle. 20 miles of no mans land separates US and Canadian customs on the Alaska highway in which I happened on a storm. I tried to push through but the headwind and being soaked to the bone meant I had to spend a night under a bridge not really in America, not really in Canada, I’m not really sure where I was. This prompted me to pay for my first bed on arrival in Canada in a community called beaver creek. On arrival I asked if I could get any groceries for the next few days. 200 miles further down the road was the motel owners response! Fortunately the two things they sold, I fancied, beer and pies. An abandoned camp gave me some shelter one night to be greeted in the morning by glorious sunshine. 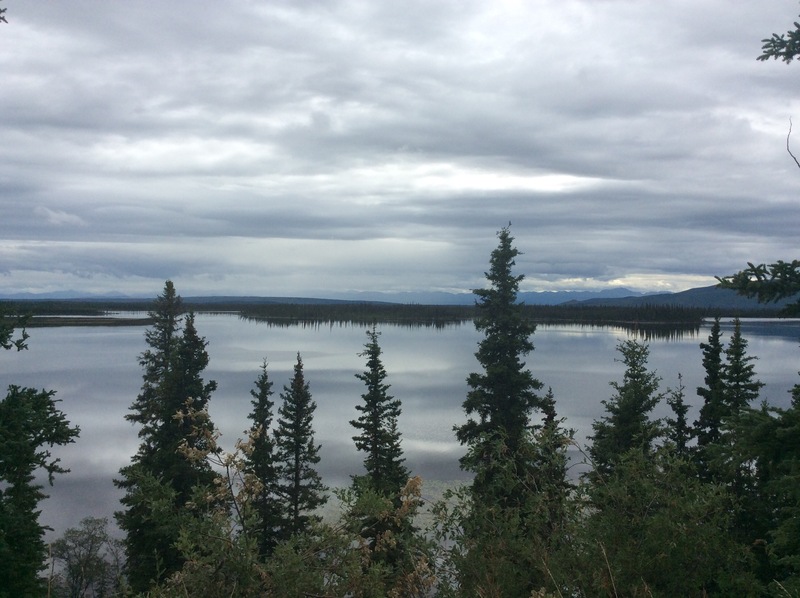 The weather got its act together as I passed through the Yukon, the north west province of Canada. The Yukon is cool. Full of absolutely nothing. The region bigger than Denmark, Belgium, Germany and Holland combined has a mere 33,000 residents. 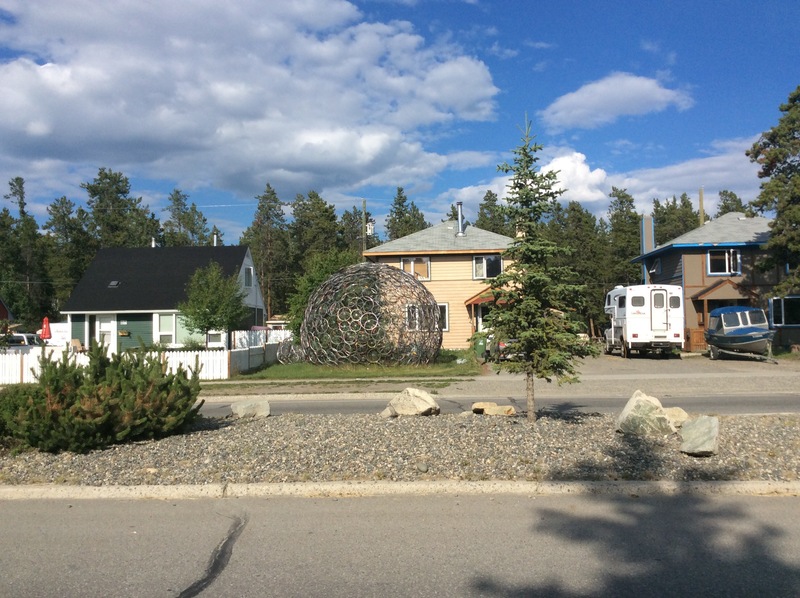 20,000 of which live in the capital Whitehorse. I started to push 80 miles a day and the scenery was immense. It was nice to see a variety of tree’s rather than the lone spruce covering northern Alaska. 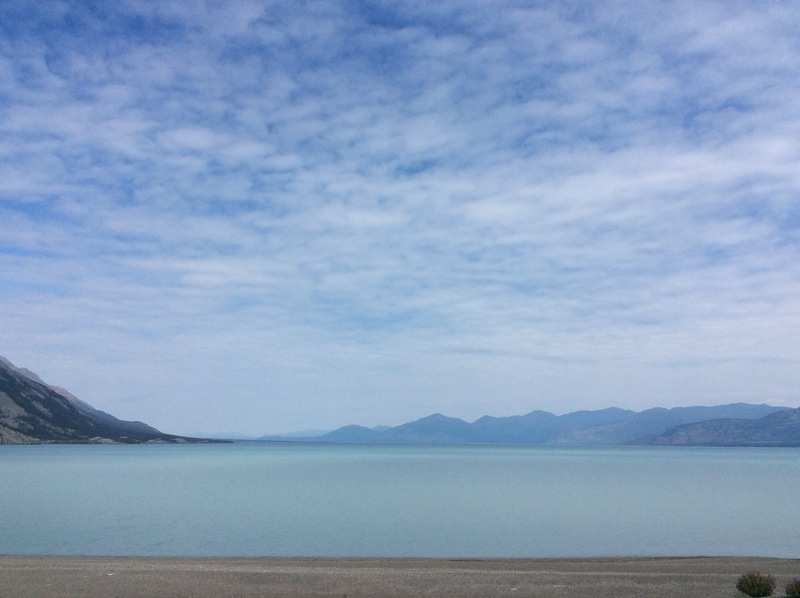 Kluane lake accompanied me for a whole day and changed colours with every turn. Frustratingly many of the state campsites, which had the benefit of bear boxes to keep my food from being eaten and company to boot, wouldn’t allow tenting, which struck me as an oddity for a campsite. The one I was allowed in was a blessing. A Yorkshire couple on a tour of the 49 states caught wind of my Huddersfield accent and treated me to an omelette, ribs, salad and fruit dinner, then in the morning a couple from Portland made me pancakes with bacon and maple syrup. I seemed to be generating a worrying amount of sympathy. Two weeks without seeing a bear was encouraging and then like buses 3 in 3 days. The first of which a black bear wandering alongside me as I was singing my heart out. He seemed particularly unfazed which put me at ease. The next day on a 2k climb a group of young lads stopped me in their pick up and told me to put the bike in the back as there was a grizzly with cubs up ahead. I figured I’d have to get used to dealing with bears on my own so I declined their offer, “we call guys like you bear bait” they told me. Approaching there was a group of cars and rv’s parked up taking photos. I waited a good few hundred meters away hoping the family would wander off the road into the bush but they just criss crossed the road and continued in my direction. I decided to calmly, but as fast as I could cycle past bear spray In hand, talking to the bear as had been advised, feeling like a total muppet. Probably managed to hit the top speed of the trip and flew past with applause from the watching crowd. This was caught on camera by one of the eagle eyed tourists whom I bumped into further down the road a few days later. He assured me he would email me the photo on his return which should make for embarrassingly amusing viewing. 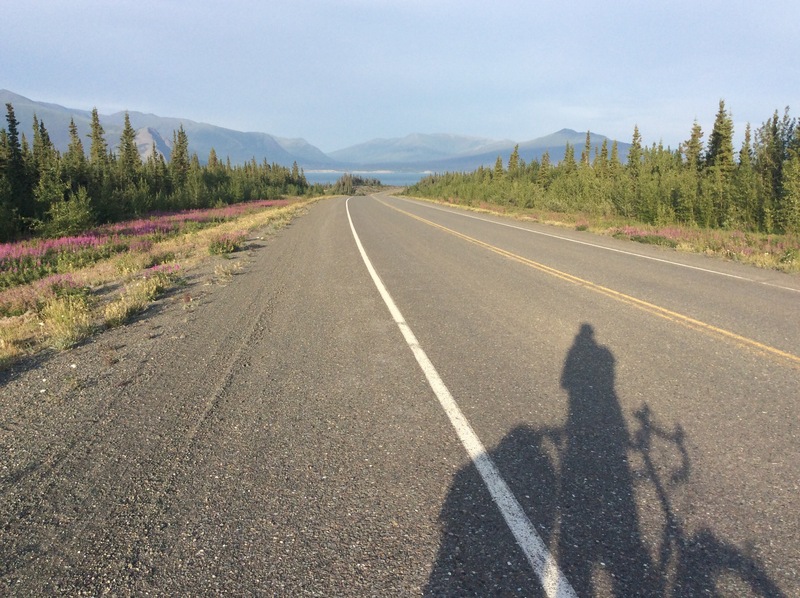 I cycled into Whitehorse just under three weeks from leaving Deadhorse! Again eager to eat the town out of its food supplies and rest up. The sheer distance between amenities was proving to be a challenge. However 1200 miles under the belt was a good confidence boost and I was welcomed into the home of Jenny, Anthony, Jasper and Olive for the next couple of days. I hit the pub straight away and sat on the banks of the Yukon river in 30 degree heat happy to forget about the bike and give my poor backside some respite. 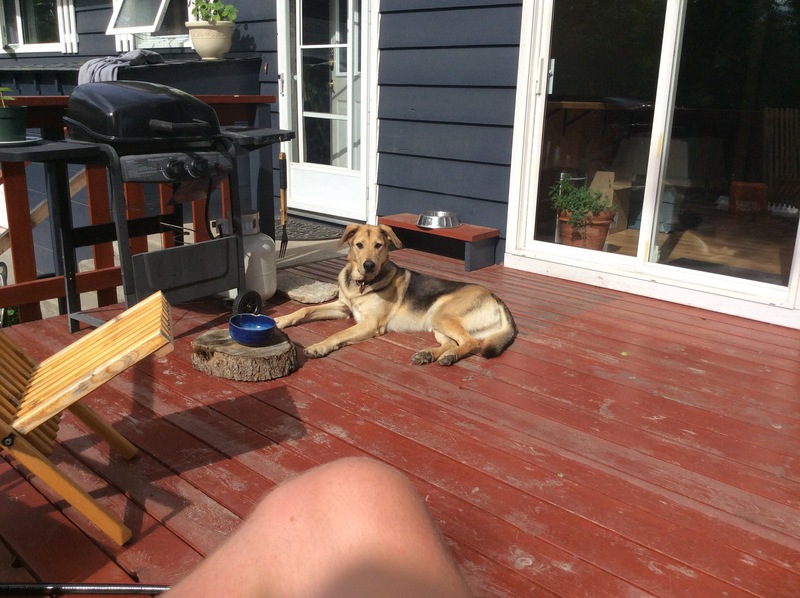 From Whitehorse to Terrace, the Cassiar and BC. Great stories! And glad to hear you finally got food after so many miles. Wow – to cycle past the grizzly with cubs takes guts – especially knowing that bears can outrun cyclists (can run up to 37 mph)! Heartened to hear that you’ve been able to meet people and that they are so generous with their hospitality: makes me proud to be Alaskan (even if the state ‘adopted’ me from Minnesota). Take care and all best wishes for the next part of your journey! brilliant well done rob. enjoyed the read, all the best.